The Trident series unashamedly takes its design cues from the iconic 1954 Rolex GMT Master which was the world's first ever dual-time watch - and the C60 Trident - Pro Automatic is no exception. 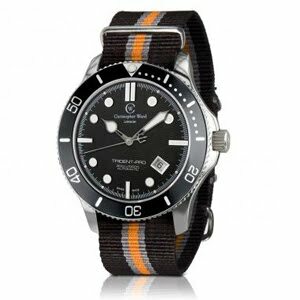 This NATO strap edition harks back to the golden era of James Bond and is introduced to mark the 50th Anniversary of 007 on our screens. Whilst the C60 Automatic can't describe the time in two time zones simultaneously, like its stable companion the C60 GMT, this automatic, powered as it is, by the famous ETA 2824-2 / Sellita SW200-1 movement is a premium diving watch which has been engineered for perfection and that famous Swiss precision. It also looks so cool on the wrist that everyone at Christopher Ward (including the women) wants one!